Edit 2: Confirmation that it's one tree! Surrounding trees on either side along the sidewalk are completely different, and the ones on the other side of the fence are short and have rounded but far smaller, as well as thicker, dark leaves. 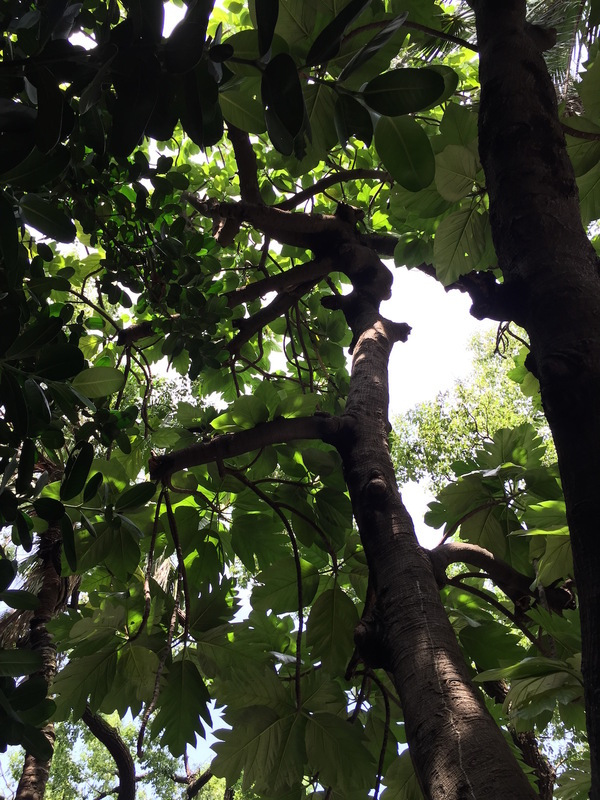 I've taken a 180 degree vertical "panoramic" photograph to show that there are no encroachments from trees with large leaves from behind. I've also included a few more photos of small clusters of leaves coming from a single large branch, again showing all three types of leaves. 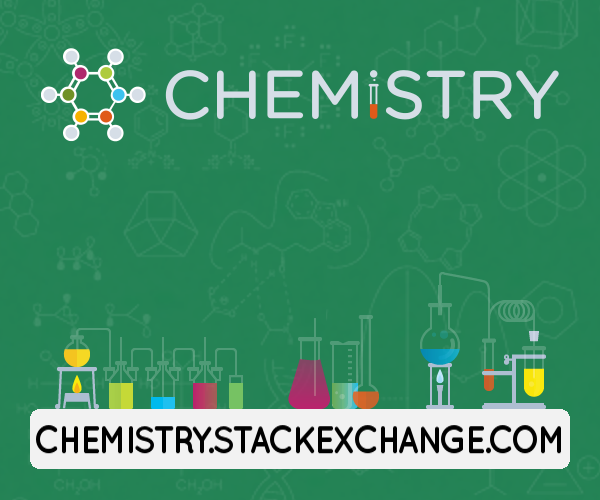 Note some of the photos are large, and if you open them in a separate tab or window you can zoom in for additional detail. 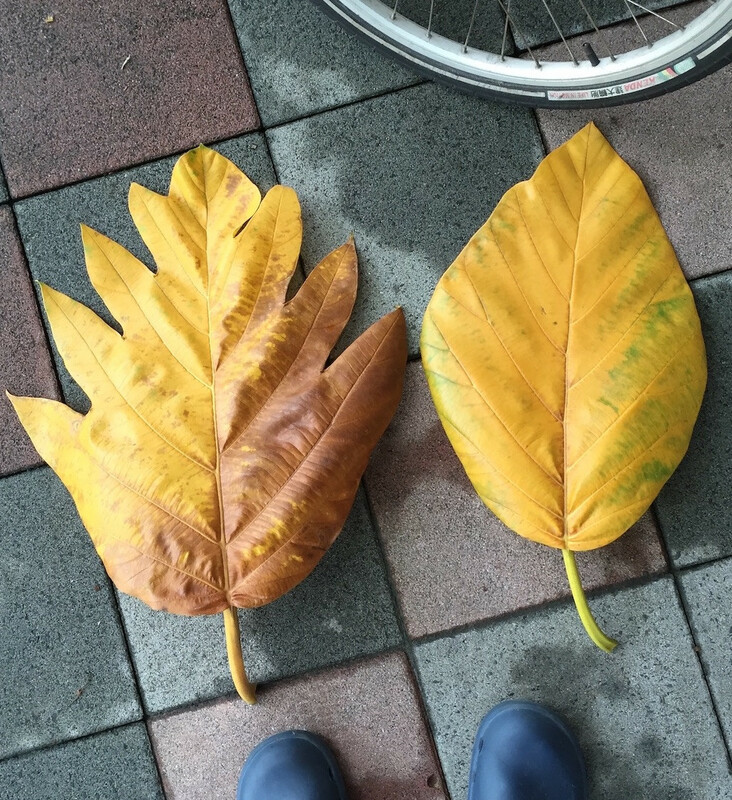 I was riding a bike in Taipei recently (November 2017, location in google maps - more views of trees: https://goo.gl/oXPHr3) and I saw two huge leaves on the sidewalk. I stopped to photograph them and realized that they were very different shapes but otherwise looked quite similar. 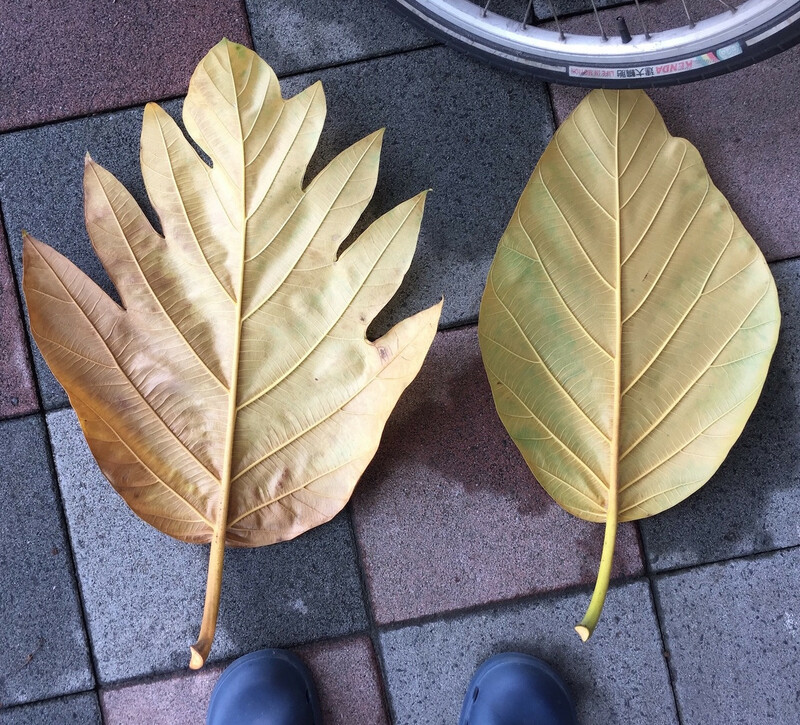 They are both over 40 cm long broad leaves, but while one has smooth edges and is "leaf-shaped", the other has long serrations (roughly 10 cm deep, 5-7cm spacing) on each edge. I took some more photos of the leaves and branches of this very large tree, and one of the trunk, which looks quite gnarly. Edit 1: I've cropped and lightened sections of two of the photos where I believe I can show examples where leaves on the same branch exhibit continuous change from smoothed edges to serrated edges. I've used 1 to denote smooth-edged leaves, 2 to denote leaves that show a few "digits" at the far end of the leaf, and 3 to denote leaves that exhibit full "digitization". In each case I think it's pretty clear that they connect to the same branch, and are not from different trees as suggested in the answer. This is strongly (if superficially) reminiscent of the sassafras leave differences. 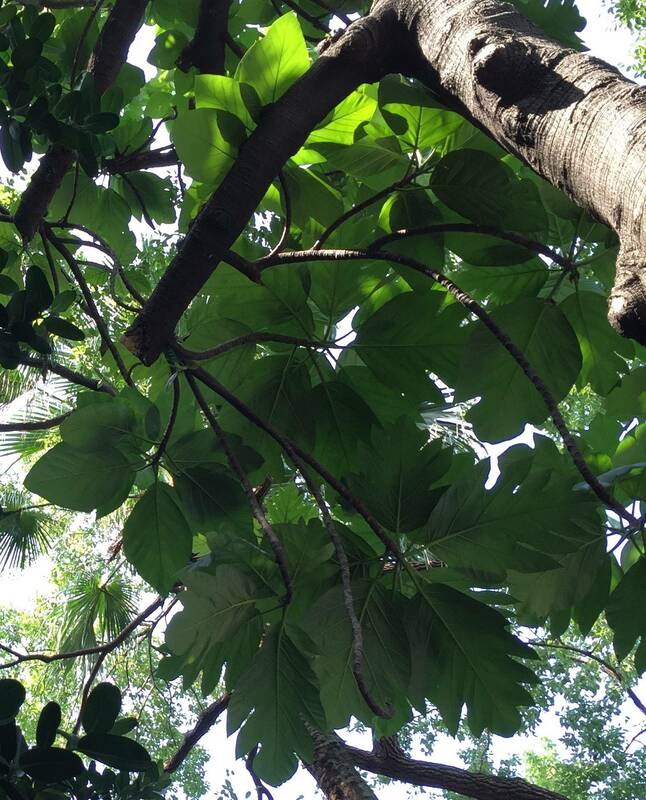 Question: What kind of tree is this, and why do its huge leaves change shape and "grow fingers"? 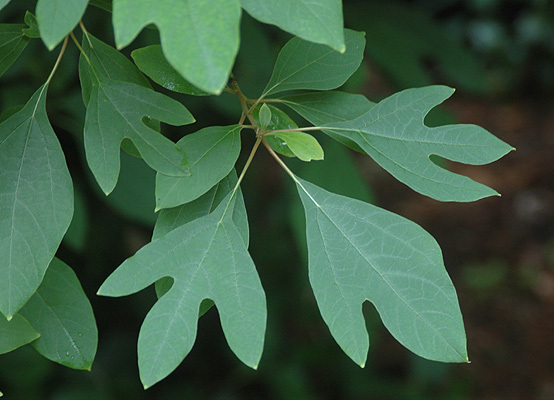 It was pointed out to me that Sassafras leaves also come in different shapes with "fingers", I've included one image of those below as well for comparison. For comparison, here's an image of Sassafras leaves with "fingers", from Landscape Plants, Oregon State University. I'm going to take a stab here. It looks a lot like Artocarpus altilis or breadfruit. 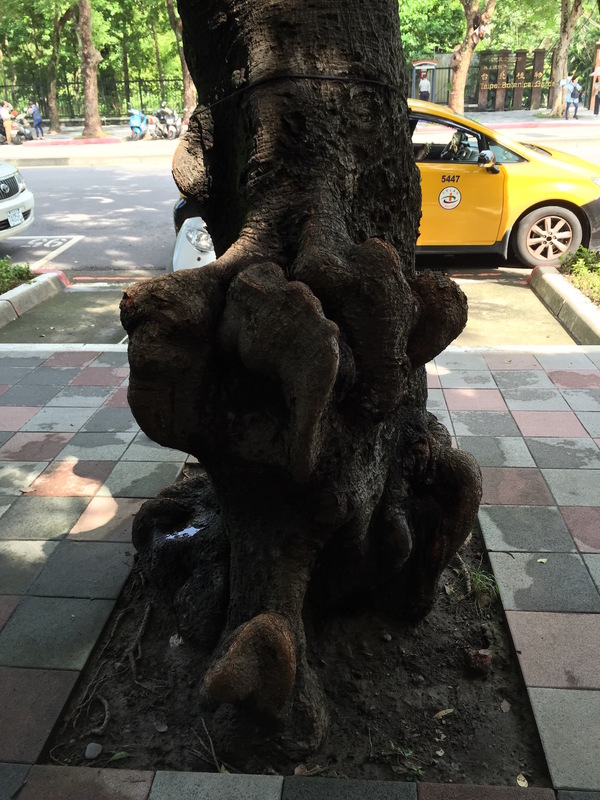 However, the trunk is a bit gnarly for breadfruit, but maybe that is the result of being a street tree. Also, I can't find any reliable information about the variation in the leaves (heterophylly) for this species. However, other species in the genus have entire leaves, so perhaps this is hybrid. 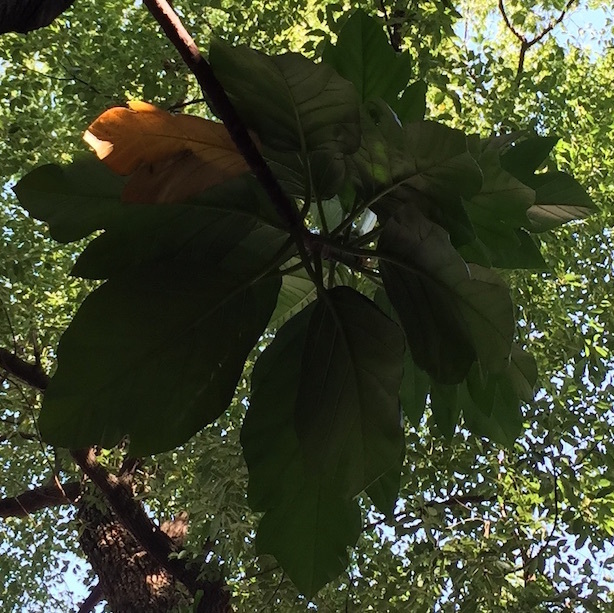 Also, Artocarpus chaplasha does show heterophylly related to light intensity and leaf position (online images suggest your tree is not A. chaplasha however). 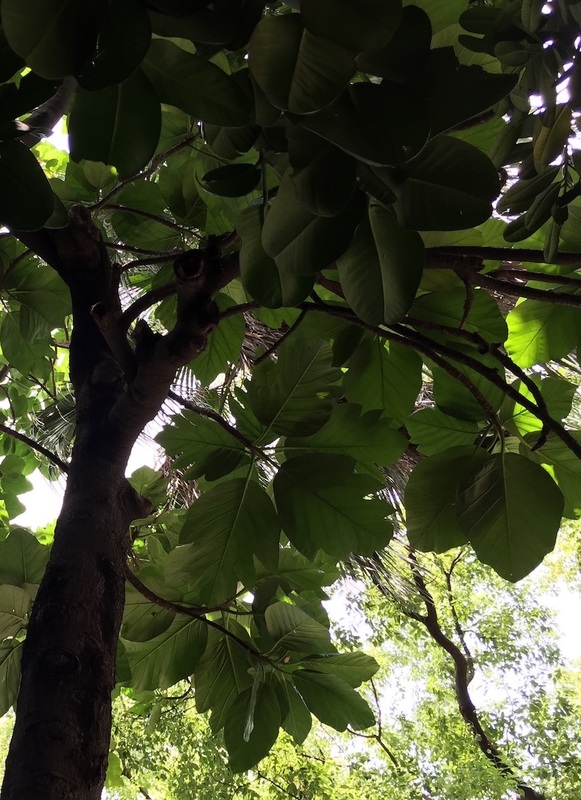 I think the climate in Taipei is consistent with Artocarpus too. If it's not breadfruit, I imagine it is a species from the Moraceae. Finally, in some of your pictures it looks like there is an adjacent tree (possibly a Ficus or Clusia) mixing in -- those leaves are obtuse rather than acute at the tip. I'm including one of your photos with the leaves of the tree in question circled in yellow, and what I believe to be the leaves of a different tree circled in red (in case my earlier comments were too cryptic). Here is an excerpt of Fig 1 from Jones et al. 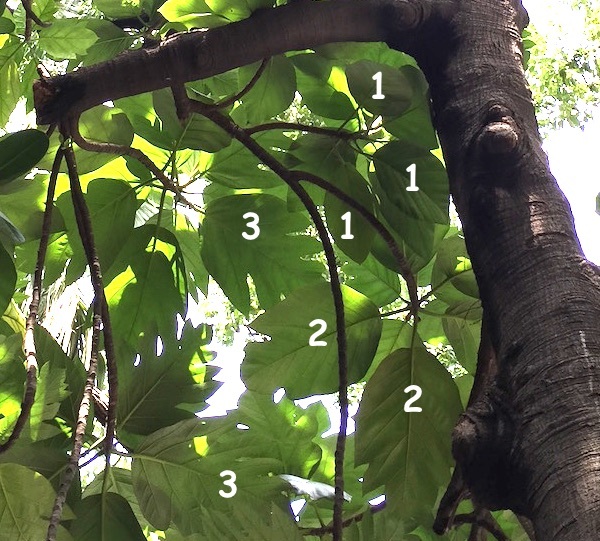 "Morphological diversity in breadfruit (Artocarpus, Moraceae): insights into domestication, conservation, and cultivar identification" Genetic Resources and Crop Evolution vol 60 no 1 pgs 175-192 (2013) which shows the diversity of leaf morphology in Artocarpus including some hybrids. I'm convinced you are looking at one of the species in this genus or a hybrid, and looking at the leaves in the panel for A. altilis there is considerable diversity (phenotypic plasticity) w/i that species, so that may be as close as it can be nailed down. Finally, I can't run it but apparently there is graphical key to Artocarpus species which might be fun to try. 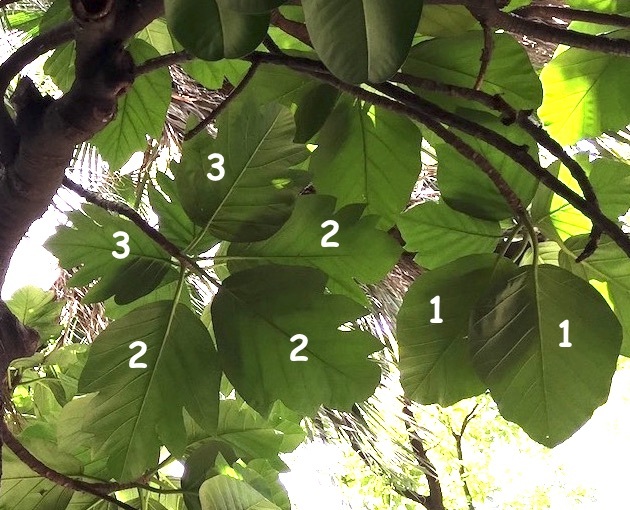 @uhoh has verified that all the leaves in the pictures belong to the same tree, so, it's likely we are seeing heterophylly based on the age of the leaves. I went back to the reference above, and found this sentence would would seem to be consistent with the young leaves being entire and obtuse (and we've already established that the more mature leaves show a lot of variation): "Leaf characteristics, such as the number of lobes, degree of dissection, size, and shape can vary between young shoots and older branches". So I think all the observations and literature point in the same direction, namely good 'ol breadfruit. Not the answer you're looking for? Browse other questions tagged species-identification trees morphology or ask your own question.